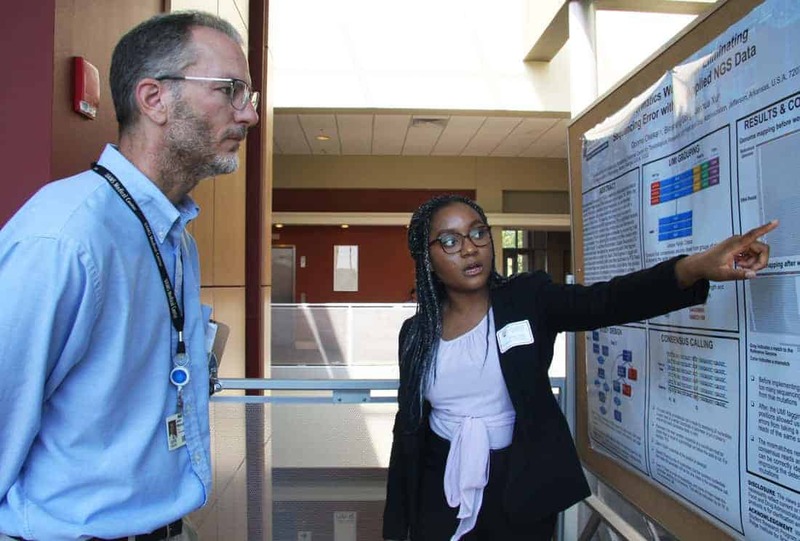 Ozioma Okeke presents research she conducted at the National Center for Toxicological Research on bioinformatics workflows for eliminating sequencing errors to John Marecki, Ph.D., of the College of Medicine Department of Biochemistry and Molecular Biology. Aug. 3, 2018 | Aug. 3, 2018 | Science can lead you to some unexpected places. Just ask Aime Franco, Ph.D., an associate professor in the UAMS College of Medicine Department of Physiology and Biophysics, who was diagnosed with thyroid cancer at 22 but never expected to make a career out of researching it. Franco gave the keynote talk July 25 to the students, mentors, administrators and guests gathered for the seventh annual Central Arkansas Undergraduate Summer Research Symposium. She initially wanted to be a physician, but then her training led down a different path. She started in sports medicine, then nutrition science and H. pylori research before circling around to thyroid cancer. In 2018, her research efforts paid off through a four-year $791,000 grant award from the National Cancer Institute to support her work. About 100 undergraduates presented their summer research at the symposium, which was held in the I. Dodd Wilson Education Building. Franco capped off the all-day symposium showcasing undergraduate research across the state of Arkansas where research careers like hers tend to take off. Students present their work with posters and oral presentations. About 120 students attended the event, with about 100 of them presenting their work. Their faculty research mentors as well as summer program administrators, poster judges and members of the public joined them for the event, for a total of about 250. The focus on Franco’s story was intentional, said Grover P. Miller, Ph.D., a professor in the Biochemistry and Molecular Biology Department in the College of Medicine. He has been co-directing the symposium with his department chair, Kevin D. Raney, Ph.D., for the past seven years. Dylan Mitchell of Hendrix College explains his research on 3D-printable optomechanical components. A deeper understanding of science – and a strengthening of science communication skills, specifically – benefits both the students and society, Miller said. Lessons like that weren’t lost on Alexis Baker, a student from Hendrix College who attended with Sydnee Curry, who was presenting a poster on their biochemistry research on pain-sensing neurons. Anfernee Hawkins from the University of Arkansas at Pine Bluff explains research on triple negative breast cancer he performed at the National Center for Toxicological Research to Karl Boehme, Ph.D., an associate professor in the College of Medicine Department of Microbiology and Immunology. Kamille Willis from the University of Miami was another poster presenter, who spent the summer doing research at the National Center for Toxicological Research in Jefferson, Arkansas. She helped develop a flow cytometry assay to analyze antibodies against polyethylene glycol. She said that the symposium and events like it teach students to not only communicate, but to listen to questions and feedback. Amber Melcher of Hendrix College talks about her thyroid cancer research. In addition, Miller said another important benefit of the event is that it showcases just how much excellent work is being done in Arkansas and the support that makes it possible. “We are a small state, but we have some great science here,” Miller said. Franco agreed, and referenced the quality of the work in her closing remarks to the students. The event was held in the I. Dodd Wilson Education Building and hosted by the Graduate School and Department of Biochemistry and Molecular Biology at UAMS as well as the National Institutes of Health-supported INBRE program and the UAMS Summer Undergraduate Research Program (SURP) to Increase Diversity in Research.